To recap: Energy drinks as Dietary Supplements must list caffeine as an ingredient, but not its amount, according to FDA rules. Soft drinks are not required to list caffeine at all, but the amount of caffeine cannot exceed 71 mg per 12 fluid ounces, or .02 percent. Caffeine amounts now appear on many soft drinks. It’s part of a voluntary, industry-wide action by the American Beverage Association. The ABA is a trade group whose members include Coke, Pepsi and manufacturers of non-alcoholic beverages, including energy drinks and tea. By volunteering to list caffeine amounts, the beverage industry creates a win-win situation. With this information, people looking to limit caffeine consumption can choose their products, as can people seeking to increase their caffeine consumption. At the same time, beverage companies have successfully prevented mandatory government regulation. So, the amount of caffeine in energy drinks remains unlimited, and existing regulations on cola drinks are also unchanged. The only difference is that North American consumers can now see in real numbers the amount of caffeine per serving. (The ABA move applies mainly to beverages in the U.S. and Canada, and not necessarily to other nations.) But the decision to list caffeine on a soft drink label remains entirely voluntary. 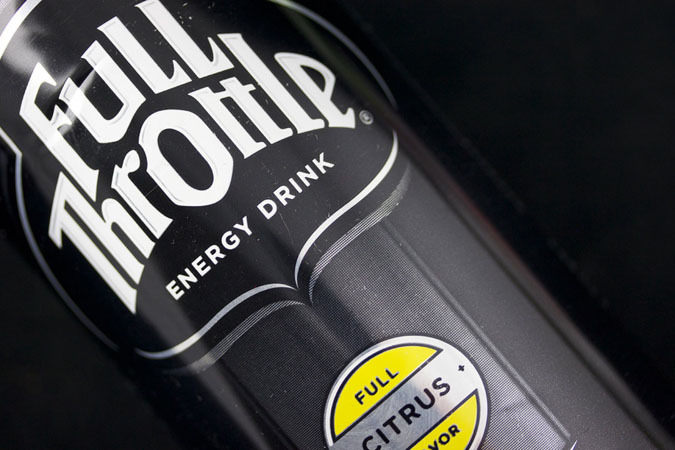 In 2o13, many energy drinks (including Full Throttle, made by Coca-Cola) switched their FDA category to food, instead of being a Dietary Supplement. As a food, these drinks now bear a Nutrition Label (not a Supplement label), which means they don’t have to list their caffeine amount. But for some unexplained reason, these energy drinks aren’t affected by the soft drink rule, which limits caffeine to 71 mg per 12 ounces. Energy drinks with a Nutrition Facts label appear to be just as abundant in caffeine as they were when they were Dietary Supplements. And most are more caffeinated than soft drinks. The ABA also says caffeine is a stimulant. In further response to Congressional pressure and to stave off mandatory regulations, the American Beverage Association adopted other voluntarily policies specifically for energy drinks. Labels, they advise their members, should list total caffeine content, and a warning that energy drinks are not recommended for children, pregnant or nursing women and people sensitive to caffeine. A good way to see if an energy drink is marketing itself to teens, sports fans, or other groups is to visit the brand’s website. That way you can decide for yourself who the brand is targeting and whether the pitch is appropriate. Report: What’s All the Buzz About?